Deceased: Age 26, November 8, 1966, KIA, Vietnam, 1st Infantry Division, Small arms fire. Post from the Vietnam Memorial Wall: “He served his country well. 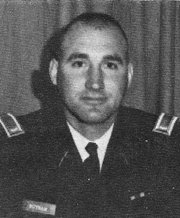 Captain Ron Putnam was a TAC Officer for OCS Class 1-66, 51st Company, Fort Benning, Georgia. Our class graduated 144 “candidates” who received a commission as 2nd Lieutenants on January 14, 1966. Captain Putnam was the 6th Platoon Tactical Officer and he was one of the best. He helped mold us into officers and combat leaders. He served with distinction and gave his life as a member of the 1st Infantry Division, the “Big Red One”. The names of 11 members of OCS Class 1-66 join Captain Putnam on The Wall in Washington, DC. We salute them all and will never forget their sacrifices.” Rick Stetson, Troy, Alabama, Sunday, July 8, 2001.